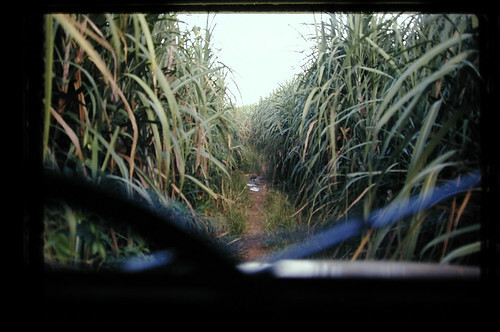 driving in the sugar fields, originally uploaded by AmyEmilia. For a change of pace, let’s head out to the sugarcane plantation near Lukala, maybe 20-30 miles from Kivuvu. Lukala also had the ONLY cement factory in Bas-Congo, if not in the entire country. And we often got bread from there (leading to the family joke that Lukala bread was hard as a rock). I also remember touring the sugar factory, and seeing the great vats of molasses. 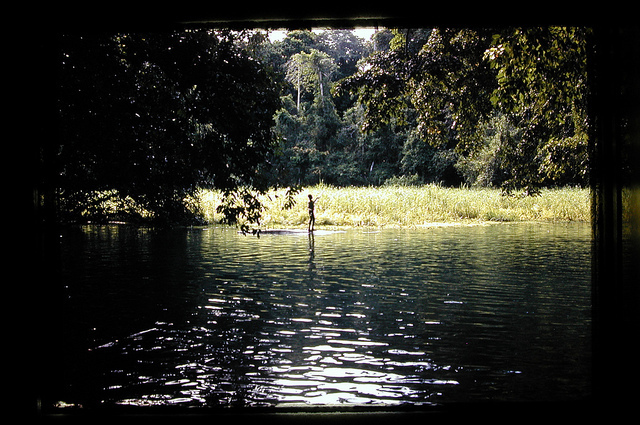 The reason we were driving through these tall canes was to get to a wonderful place called Jacques Foret, a spring-fed pond with incredibly clear water and a spooky cave. I only made it out there a couple times, since this qualified as both a big time commitment for my parents as well as a hassle to get permission to cross the fields. The road wasn’t bad as I recall, but obviously the view was restricted and those sharp-edges leaves cut the arms of the unwary who left the windows open. But Jacques Foret was well worth the effort, as you can see. The water was crystal clear, cold, and deep. A few fallen trees floating in the water provided a place to hang on. The cave (no photos, unfortunately) was flooded most of the way in, and did have bones in it. I can’t quite trust my memory on if they were human but they may have been. Certainly this area would have been well-known to the local folks for its wonderful water. Dad had fewer reservations about us swimming in this water since it was fast-flowing. 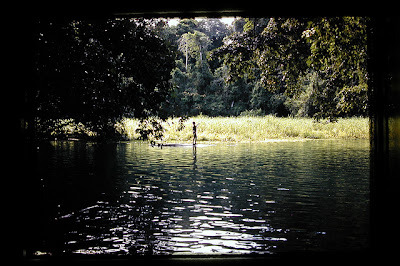 In stagnant water there was always the risk of schistosomiasis (sleeping sickness or bilharzia). Oddly, I don't remember any mosquito population here, but I'm sure there were some. My predominant memories of this oasis are coolness, and peace, and a bit of edginess about the cave. I'd love to go back and see if it has changed in the last 40 years!